If your cornea lacks an insufficient degree of curvature or your eyeball is too short, you’ll be farsighted. These defects, called refractive errors, prevent light from focusing correctly inside your eye. Instead of an image being focused on the retina, your eye focuses it behind the retina. This results in blurred close vision. About 5 to 10 percent of Americans have hyperopia. You’re more likely to be farsighted if your parents are. To diagnose hyperopia, your eye doctor will give you eye drops to temporarily suspend your eye’s focusing mechanism. Then, he or she can assess how farsighted you are. 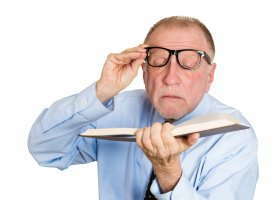 If you are only a little farsighted, your eyes might be able to compensate without any intervention. Many hyperopic people can benefit from corrective lenses, either eyeglasses or contact lenses. Corrective lenses help your eyes focus correctly by altering how light enters them. Eyeglasses are the simplest way to correct hyperopia. However, many people prefer contact lenses, since they provide slightly clearer vision than glasses do. Your doctor can discuss the pros and cons of each. Several types of refractive surgery permanently alter the shape of the cornea, decreasing or eliminating the need to wear corrective lenses. The ophthalmologist uses a small laser to reshape your cornea by sculpting tiny amounts of corneal tissue. To treat hyperopia, he or she increases the curvature of the cornea. If you think you might be farsighted, call us today so we can help find the most appropriate treatment option for you.